Please call your Senator to ask their help to restore the loan limits. They need to hear from YOU today. The Restoration of the FHA Loan Limits is vital to both home ownership and our economy. On October 1 the mortgage loan limits declined in 669 counties in 42 states. This immediately reduced mortgage liquidity and home buyers’ ability to obtain a mortgage. The House and Senate are now deciding whether or not to restore the loan limits. The restoration of the loan limits to their prior levels has been included in an Appropriations bill being deliberated by Congress this week. Your Senator is a member of the group of Congressional leaders who will decide whether Congress will restore the loan limits. This is why they need to hear from you today. Please call your Senator's office to ask that they support the restoration of the loan limits in the Appropriations Bill. Why is this so important? Without the restoration of the loan limits the availability of safe, affordable, reliable mortgage financing will continue to diminish. If this happens, many of your clients run the risk of being priced out of the American Dream of home ownership. Even worse, this could hold back the housing recovery. This Call for Action requires you to do something a little different. In order to track the calls we are making to Congress, we need you to follow the link and enter your email, phone number and zip code to be connected to your Senator's office. You can make this call now, or later today, but we need you to make this call. Congress can act at any time. After you enter the information and hit the button "Click to Call" you will receive a phone call with instructions before being patched through to Capitol Hill. I am ready to make my call. I am a constituent and a REALTOR®. Housing markets are fragile. I am on the front lines and can assure you that buyers are having a hard time obtaining mortgages, and sellers are having a hard time selling. I strongly urge you to restore the mortgage loan limits. This is not just a high cost issue. Mortgage liquidity has declined in nearly every state. If you call outside of office hours, please leave a voicemail communicating the message above. This call is important. We must speak loudly and clearly with one voice to ensure the further recovery of our economy and the housing market and educate every legislator why Home Ownership Matters. 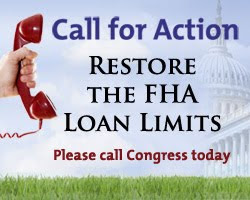 Please call NOW and tell your Senator to support Home Ownership by restoring the loan limits. On behalf of the NAR Leadership team, thank you for your support and time.